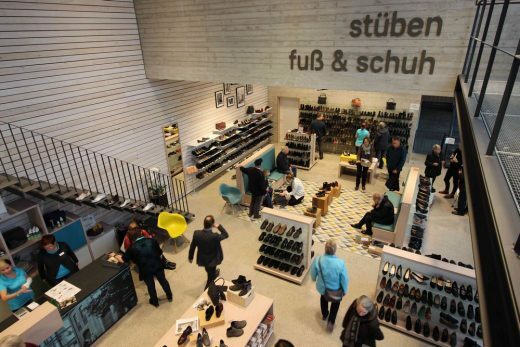 Founded in 1895, stüben fuß & schuh has a long tradition as orthopedic shoemakers and shoe retailers. Quality, service, authenticity and local anchoring are the keywords for the brand. 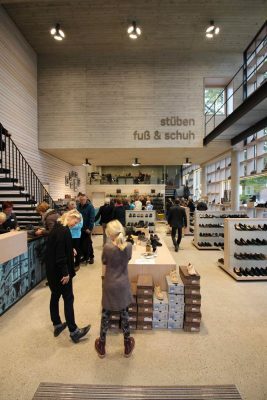 The store presents itself to the public space as an open and innovative building that combines function, design and branding. 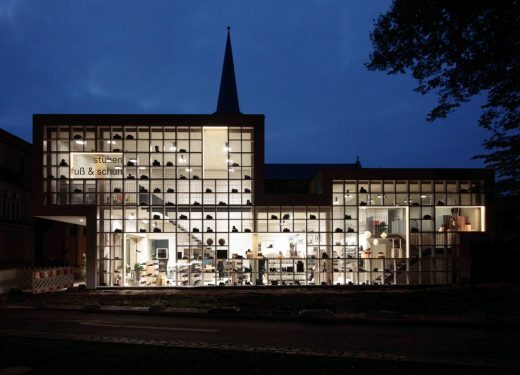 With its striking profile, the building creates a striking completion of the urban block and becomes a landmark in the public space. 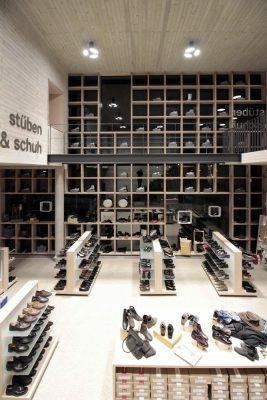 The façade is designed as a full-height wooden shelf that becomes a large display window both outwards and inwards. 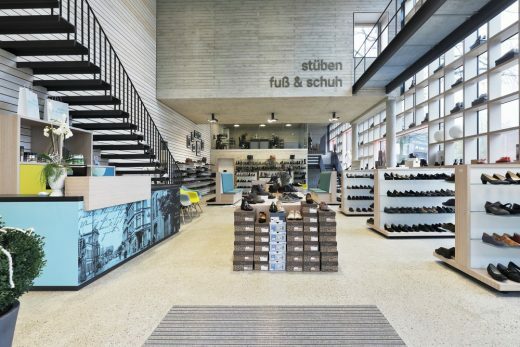 Viewed from the exterior, the store-front becomes a type case, framing the changing collection. 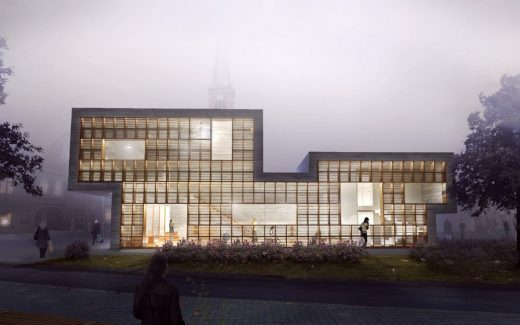 Viewed from the inside, the collection is embedded in the public space that becomes its changing backdrop. 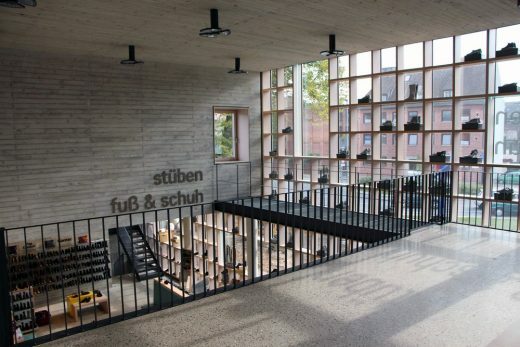 The interior is dominated by the in-situ concrete shell with exposed imprints of the wooden shuttering. 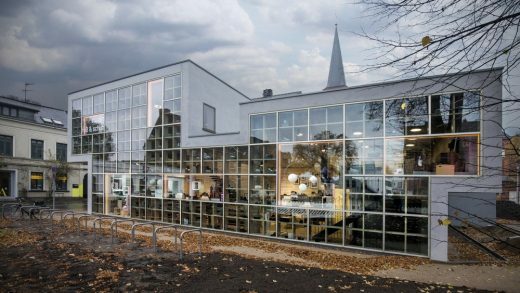 The shell wraps around creating the characteristic profile and dividing the interior into a sequence of single and double height spaces. The interior design with bespoke furniture supports the sequencing of the sales-space by creating areas of different function and atmosphere. 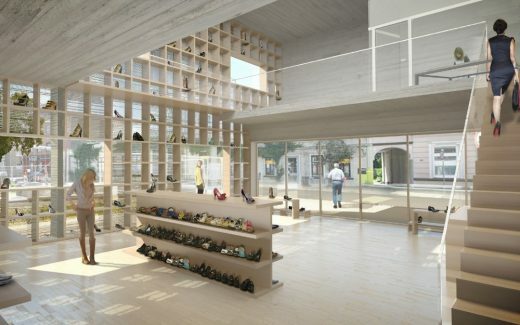 The dominant material for the furniture is the same layered beech wood as used for the façade shelf. 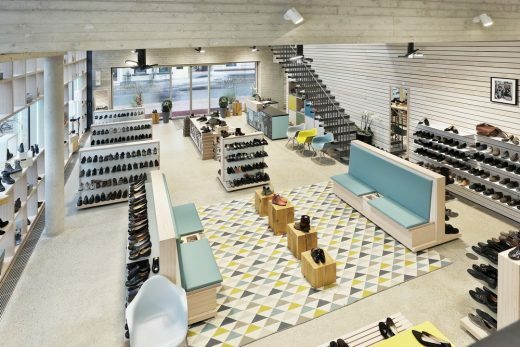 In the back of the store, the shoemaker workshop is integrated into the sales-space. In this “glass workshop” the process of shoe manufacturing can be experienced, bringing craftsmanship to the customer’s attention. A cantilever steel stairway leads up to the gallery that in a similar way integrates the office area is into the sales space. 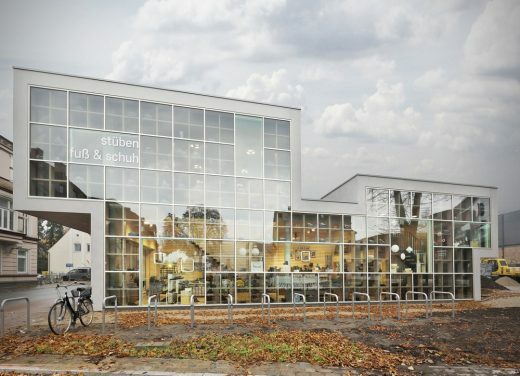 On the entrance side, the new building is two stories high. 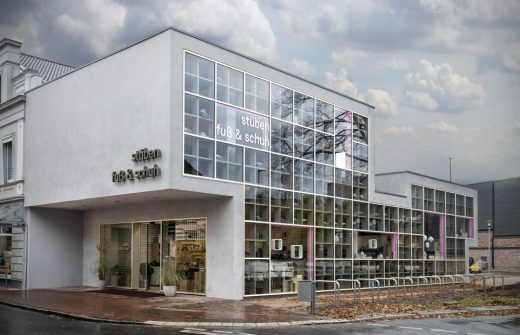 With its minimalist design, it is put in a dynamic contrast to the existing Wilhelminian style building. 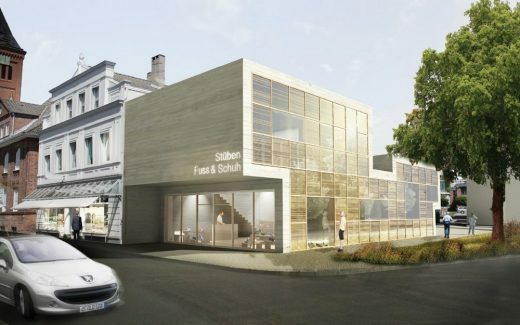 The first-floor façade is completely closed and serves as a calm background for the brand logo. 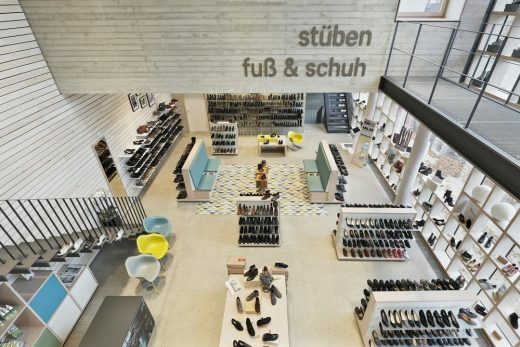 All together the Shoe Shelf Store, has given this long-established shoe company a contemporary extension that puts quality and craftsmanship into focus and lifts shopping to an urban shoe experience in a versatile spatial setting.